This week's entry for Ben Towle's Animal Alphabet is a super-quickie, because it's my husband's birthday & we spent last night doing some advance celebrating. Interesting how many yellow-bellied whatsits are represented in nature's alphabet. I don't recall so many other belly-color names showing up. And I don't think there are any lily-livered skinks, &c., so it's not that they were all named by B Western characters. Which just reminded me of that lovely oath from Zorro, "meal mush & goat's milk!" Enough tangents! 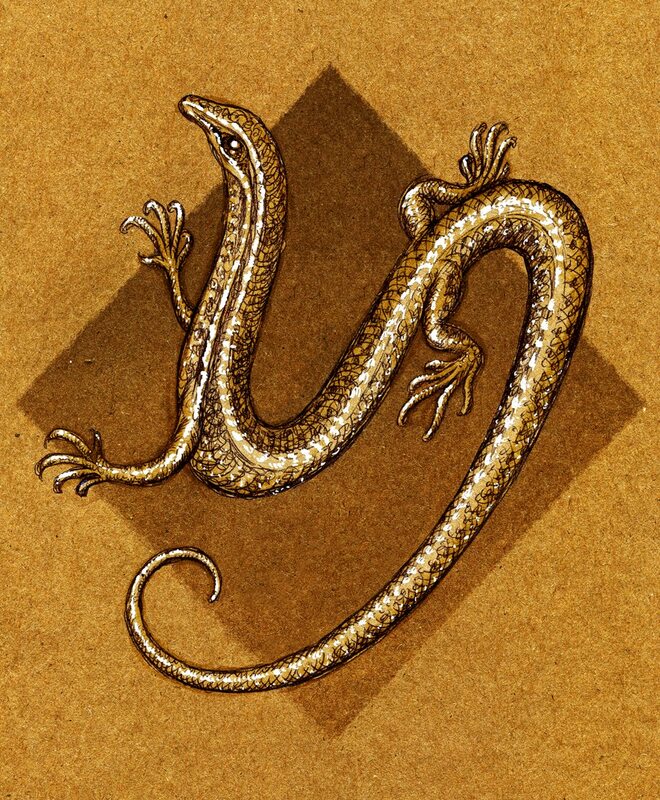 And sorry, skink, for putting you through such contortions to simulate a "Y". You may stretch out now. Ball-point, marker & white gouache on brown paper, with some Photoshop tweaking. Yes! There are a lot of yellow-bellied somethings out there! Nice work! Aren't there plans for another "lap" through the alphabet using imaginary creatures? I know I'm hoping to do it. Thanks Lupi! Your Yaffle is gloriously yellow-bellied in plumage, if not in name. Isaac, somehow I missed that plan-- but I'd love to be in on it! Oh goodness!!! I missed all of these beautiful paintings and illustrations!!! These are the more proper cousins of the alphaBeasts. I drew an abecedarian series before. I am inspired to do another one.